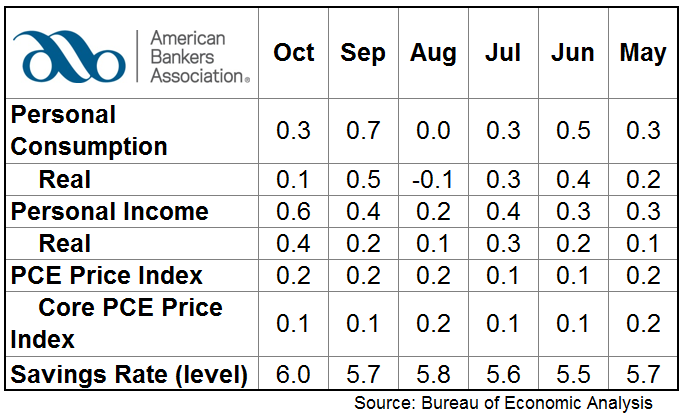 Income growth outpaced spending in October, pushing the savings rate up. Personal income increased 0.6% ($98.6 billion) in October according to the Bureau of Economic Analysis, up from a 0.4% increase in September. Personal consumption expenditures also increased, rising 0.3% or $38.1 billion. Disposable personal income – personal income less personal taxes – increased $86.5 billion (0.6%). The personal savings rate – personal savings as a percentage of personal income was 6.0%, up from September’s rate of 5.7%. The price index for PCE increased 0.2%. Excluding food and energy, the index increased 0.1%.